We’d love your help. Let us know what’s wrong with this preview of My Goodness by Nesta Aharoni. To ask other readers questions about My Goodness, please sign up. There are all kinds of parenting books on the market written by doctors and psychologists, but who is better qualified to write a parenting book than a good and successful parent? This is a mom-view book, written by a parent who takes on the most important role of a parent – to instill goodness and decency in their children. The book is filled with good, common-sense parenting skills and includes a wide variety of topics that covers the baby years through the teens. Never a simple “how to” book, There are all kinds of parenting books on the market written by doctors and psychologists, but who is better qualified to write a parenting book than a good and successful parent? 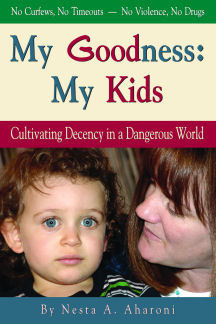 This is a mom-view book, written by a parent who takes on the most important role of a parent – to instill goodness and decency in their children. The book is filled with good, common-sense parenting skills and includes a wide variety of topics that covers the baby years through the teens. Never a simple “how to” book, but a thoughtful collection of experience and wisdom shared freely. I enjoyed reading about the lessons she learned from her children, especially in the Boys Will Be Boys section! My favorite part of the book is at the end when each of her children wrote a section to share what good parenting meant to them. My Goodness: My Kids is a wonderful book that I do not hesitate recommending to any parent, or as a gift for a new parent. Think of what kind of impact it would have on our society if more parents would make goodness and decency the goal of success. I think a lot of Aharoni's book has to do with treating kids like people, like participating family members. There are definitely some ideas I will try to utilize in t he future. One is teaching kids to argue, not based solely on feelings, but on reasonable well-formed arguments, with supporting facts, and to accept other people arguing back, reasonably.